BUT. The government must accept public comments on their proposed repeal before they can move forward with this insanity. So YOU need to comment. Publicly. I'm writing to state my objection to Administrator Pruitt's proposal to repeal the Clean Power Plan which would be a disastrous, immoral and short-sighted decision that will seriously harm public health and threaten the future health of our planet. Regardless of what Trump says, climate change is real and it is happening all around us right now (to wit, the off the charts destruction caused by Hurricanes Harvey, Irma and Maria, the record temperatures, brutal wildfires, and unprecedented melting of the polar ice caps...) The Clean Power Plan is one of the most effective tools we have to fight climate change and protect the air we breathe. 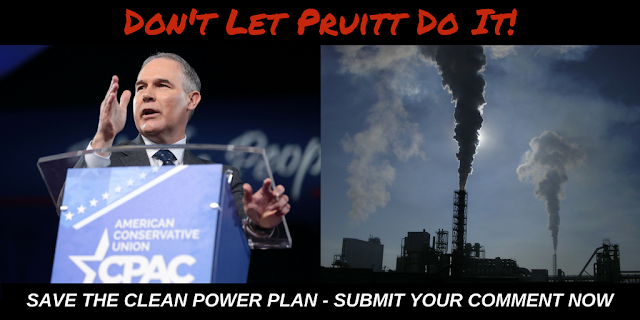 Please do NOT put our environment and our health at risk - protect the Clean Power Plan and focus your efforts on reducing power plant pollution and the dire threat of climate change. 3. Click "Continue". On the next page, review the preview of your comment and if it looks, good, at the bottom, mark the checkbox by their disclaimer and hit "Submit." If you'd like, you can enter your email on the next page to get a "receipt" of your public comment. 4. Spread the word. Share this on Facebook and Twitter. Share it via email. Share it via text. The deadline for public comments is December 15th so it's up to all of us to speak out in deafening volume before then. You're welcome to retweet what I shared below or write your own posts/tweets.